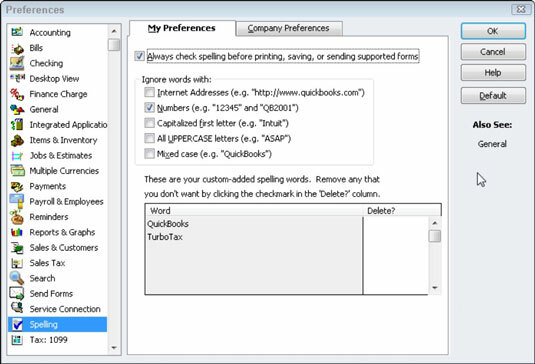 No company preferences exist for the Spelling Preferences in QuickBooks 2012, but the My Preferences tab provides several options for controlling how spell checking works for you within QuickBooks. You can select the Always Check Spelling Before Printing, Saving, or Sending Supported Forms check box, for example, if you want to have automatic spell checking performed before you actually distribute a document to an outside party, such as a customer or vendor. You can also use the Ignore Words With check boxes to tell QuickBooks not to spell check words or phrases that aren’t going to appear correctly spelled because they aren’t real words. For example, you can select the Internet Addresses check box to tell QuickBooks that it shouldn’t check Internet URL addresses. And you can select the All UPPERCASE Letters check box to tell QuickBooks that it shouldn’t attempt to spell check words that are acronyms and abbreviations, such as OK and ASAP.